Lecture in Toronto: "Jacob of Edessa"
The ancient Babylonians used many myths about their Gods to explain nature. The pre-eminent myth of the seasons however remains to this day one of the greatest stories ever told. The myth is the love story of the God Tammuz and the Goddess Ishtar. This same love story along with the resurrection, death, marriage and birth of Tammuz are holidays used to explain a fertility ritual connected to the agricultural birth-life-death-and-renewal cycle. In the myth Ishtar symbolises the lunar and female reproductive cycle, whereas Tammuz symbolises the cycle of the seasons. - Fasting for 40 days. - Burning of Yule(Yala) log. God with water urn Ea? But a terrible day was to come when Ishtar would lose her lover, and would have to travel to the ends of the earth, and endure much pain and suffering, in order to bring him back. The myth tells how Tammuz is killed, during the same month that bears his name. In the burning days of late summer the people came to the fields, where Tammuz stood, and cruelly murdered him with sickles scattering his flesh over the land. When the Goddess Ishtar learned of the death of her beloved, she was distraught with grief. Weary and worn from weeping she knew that she must find the spirit of Tammuz and bring him back to life, whatever perils faced her. Ishtar finally descends to the netherworld to rescue Tammuz from “land of no return.” During these events in the netherworld , everything on earth is withering away. Trees and plants wither and die and animals and humans alike are sterile. When Ishtar pleads with the Gods to restore Tammuz to life, the Gods agree, but to a partial reprieve only; whereby Tammuz spends six months in the world of the living and the following six months in the netherworld . Hence Tammuz is restored to life in the netherworld and together with his lover Ishtar they triumphantly return to earth on the first day of spring and the start of the New Year in Beth Nahrain. Over the centuries as the myth was passed from generation to generation the love story was further elaborated. The expanded version of the myth explains how Ishtar's husband Tammuz, who was also her son and her brother, came together with Ishtar in the world. She bore him, she made love with him and yet she remained a virgin. After Tammuz was killed by a wild boar, Ishtar put ashes on her head and mourned for 40 days, giving up all pleasures and food. But then, she discovers that she is pregnant. She declares that it is a miraculous conception and in celebration of this miraculous pregnancy, this divine fertility, she has an egg of gold made, calling it the golden egg of Ishtar. 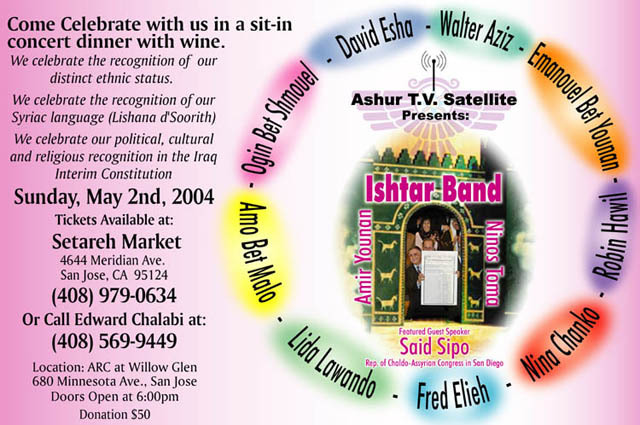 Ishtar searches for Tammuz all over the world. And finally finds him in the netherworld and eventually brings him back to life. Tammuz is resurrected and the vegetation again flourishes. Then ancient Babylonians also celebrated this event by colouring eggs and rabbits were used to symbolise fertility and the God Tammuz. In ancient Babylon when Tammuz died, the followers of Ishtar joined her in mourning and proclaimed a forty day period of sorrow each year prior to the anniversary of the death of Tammuz. During this time, no meat was to be eaten. Thus the practice of mourning for the loss of the "son of god" was adopted by many for centuries thereafter. This act was later "Christianised" and given the name of Lent. Today Easter falls right after the observance of the forty days of Lent. In Beth Nahrain, during the time of growth when the first rains after the long summer fell, the people also celebrated the festival known as the Holy Marriage of Ishtar and Tammuz - yearly at the autumn equinox - which brought the land fertility and growth yet again. Tammuz had returned from the netherworld and made love with Ishtar again. This time was also the second harvest, the harvest of the fruits, a time of winemaking and the slaughtering of animals in preparation for winter. In each legend, Tammuz dies young and his birth is honoured on his birthday which coincided with the Winter Solstice. This was celebrated around December 21 st . Part of the religious ritual involved cutting down a young evergreen tree as a way of commemorating the premature death of Tammuz. Along with this the Babylonians would also burn a Yala (Yule) log, called "the log of the son.” It was burned in the fire to symbolise the death of Tammuz. The next day the evergreen tree would be decorated with silver and gold. The log that was burned was now alive again as the Tammuz tree. The Old Testament book of Jeremiah (Jeremiah 10:3-4) also describes how the Birth of Tammuz was celebrated in ancient Babylon , "..for one cutteth a tree out of the forest, the work of the hands of the workman, with the ax; They deck it with silver and with gold; they fasten it with nails and with hammers, that it move not." In 313AD, while battling to become the new emperor of Rome , Constantine claimed that he saw a burning cross in the sky, with the words, "in this sign, conquer." After emerging victorious from the battle he finally gave Christians freedom of worship throughout the Roman Empire . It was not until 380 AD that Emperor Theodosius introduced legislation that affirmed the dogmas of the Council of Nicaea and made church membership compulsory. By 393AD, he had made Christianity the official and only state religion of the Roman Empire . He then undertook the forcible suppression of all other religions, and the prohibition of all forms of paganism. Any who would dare to hold to any other form of worship were considered heretics and would suffer severe punishment from the state. The people of Babylon who, at the time, practiced the Babylonian religion, its priests and its practices, were assimilated into the Christian church by force. With the Christian church no such festival as Christmas was ever heard of till the third century and it was not till the fourth century was far advanced that it gained much observance. The late-December holiday when they burned the Yala log and decorated the evergreen Tammuz tree was given the name Christmas, presumably to celebrate the birth of Christ. The autumn marriage feast celebrating the marriage of Tammuz and Ishtar was renamed by Emperor Constantine to the Feast of the Holy Cross. Ishtar the queen of heaven and her child became the Madonna and child. The spring holiday of the golden egg of Ishtar was called Easter, and given the meaning of observing the resurrection of Christ, not Tammuz. According to ancient Babylonian myths and history, the resurrection, death, marriage and birth of Tammuz and Ishtar are ancient Babylonian holidays that have never left us. Hijacked by the Roman Empire and then “repackaged” as Christian holidays, they remain stark evidence of the depth and piety the ancient people of Beth Nahrain once held for their ancient Gods. Encyclopedia Britannica, Vol 18, p.926. (ZNDA: Baghdad) An Assyrian police lieutenant was killed by unidentified gunmen in an attack last Friday evening, 26 March, in the city of Kirkuk. Lieutenant Romeo Esha David, a member of the Assyrian Democratic Movement, was killed in his home. Mr. David was born in Kirkuk in 1974. He held a B.Sc. in languages from Baghdad University. He joined the ADM and worked as a lieutenant at the Kirkuk Police Bureau. The divisions among Kurds, Arabs, Turkmen and Assyrians in Kirkuk have been increasing in the postwar era resulting in political assassinations, intimidations, and terror attacks in the absence of security. The governor of the province of Kirkuk, Abdul Rahman Mustafa Zangana, stated that the city of Kirkuk's Council has suspended its duties until further notice, because the Arab and Turkomans members have suspended their membership in the City Council and the Chaldo-Assyrian members are demanding better coordination between the various ethnic and religious groups. He also stated this week that he has requested from the Coalition Authority to interfere in this matter. The Kirkuk City Council consists of 40 members: 7 Chaldo-Assyrians, 10 Arabs, 8 Turkomans, and 15 Kurds. (ZNDA: Baghdad) According to al-Zamman newspaper - based in London - a U.S. officer of an Iraqi origin, General Giwargis George, was confirmed this week to coordinate the establishment of the new Iraqi Defense Ministry. Meanwhile, reports from northern Iraq have confirmed the appointment of General Giwargis Hurmiz Sada as the Chairman of the Joint Chief of Staff of the Iraqi Armed Forces. General Giwargis (also known as Gaggo Tayyar), served as a pilot, and was imprisoned by the former Ba'ath regime. He left the country later only to return after the liberation of Iraq. At press time it is yet not confirmed whether General Giwargis George and General Giwargis Hurmiz Sada are the same person. (ZNDA: Hassaka) When normal life was slowly returning to the Hassaka governorate in Syria an Assyrian bishop reported in a press conference that two explosives were defused in a public area of the Qamishli city. The bishop of the Assyrian church in Hassaka, Mar Matta Rohem, confirmed news of finding the two explosives and said they were defused, belittling their destructive power. Mar Rohem said in press statements that the two explosives were found in Qamishli near the Jaghjagh Bridge which links the two parts of the city. He refused to hold certain side responsible for this matter, ruling out the alleged possibility that members of the Kurdistani Banked Labor party are responsible for the operation. Christian circles in Hassaka stressed that the first American tourists arrived, despite the warnings launched by western embassies in Damascus to avoid traveling to the Syrian al-Jazeera area. (ZNDA: Baghdad) Ambassador Paul Bremer dismissed the governor of the Nineveh province, Mr. Ghanim Sultan al-Basso, last week from his duties and banned him from any future government position in Iraq. Other reports suggest that al-Basso had resigned on his own volition. Bremer commented that al-Basso was a high-ranking member in the Ba'ath Party and an ex-Major-General in the Iraqi Army; and that al-Basso had failed to secure stability in the Nineveh governorate. (ZNDA: Baghdad) Iraqi archaeologists have confirmed the discovery of the names of three previously unknown Assyrian queens. Archaeologist Dr. Ahmed Kamel confirmed that his encoding of the newly discovered golden bowls at the palace of King Shalmanesser II in Nimrod in the Nineveh governorate, has uncovered the names of the three Assyrian queens. The three queens are: Baba, wife of Tiglath-Pilesser III; Banitu, wife of Shalmanesser VI; and Talya, wife of Sargon II. The latter monarch built his capital at Dur-Sharrukin (Khursabad). Archaeologist Kamel stated that the tombs of the three queens were made of bronze. They included clothing and jewelry, pottery, and dishes that had traces of water and food, which reflect the Assyrians' belief in life after death. A collection of rare Christian manuscripts—some dating to the sixth century—will soon be accessible to scholars worldwide, thanks to a first-time collaboration between Brigham Young University, the Vatican Library and the Assyrian Church of the East. Working alongside their Vatican colleagues for three years, BYU scholars imaged more than 14,000 pages of text to produce a digital library of 33 important Syriac Christian manuscripts, which will be available on DVD. For Bishop Mar Bawai Soro of the Assyrian Church of the East, access to these texts—which for centuries were out of reach—will help his church members to reconnect with their heritage. 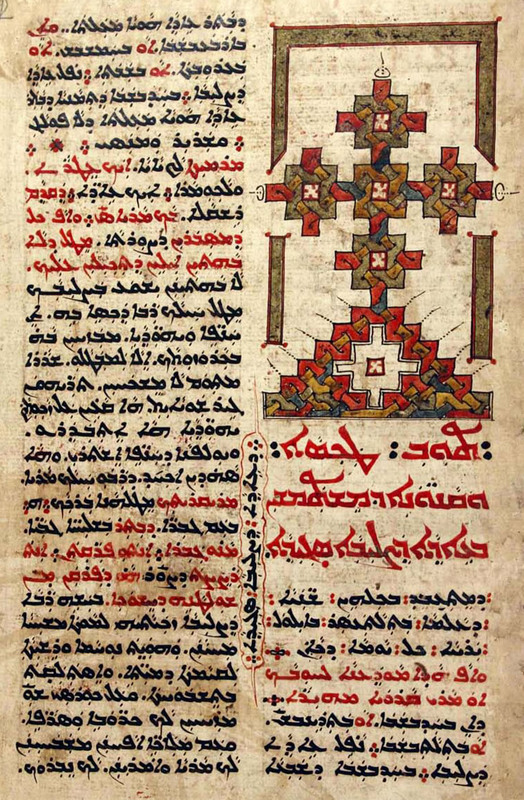 Working alongside their Vatican colleagues in the Vatican Library for three years, BYU scholars imaged more than 14,000 pages of text to produce a digital library of 33 important Syriac Christian manuscripts. "It as rather an emotional moment when I first viewed the content of the DVD in Rome," says Bishop Soro, a San Jose-based leader of one of the world's oldest Christian churches. "These manuscripts really tell our 'lost' story." "Our church is so small and insignificant today, but these manuscripts tell of the forgotten glory that our forefathers and foremothers had. In addition, they contain what we believe and hold valuable as teachings and traditions, as doctrine and dogma," he says. In 1997, Bishop Soro approached the BYU Institute for the Study and Preservation of Ancient Religious Texts about creating a digital library of Syriac Christian texts. "He had heard about our Dead Sea Scrolls database project and wondered if we might be able to do something similar with the textual tradition of his church," says Noel Reynolds, executive director of the institute. "These texts present important Eastern Christian traditions that have not been preserved in the Greek manuscripts. Our perception of Christian history often ignores the Eastern component, which was at least as important historically," says Reynolds. "There's a renewed realization of the importance of the early stages of the growth of Christianity," says Kristian Heal, a research associate for the institute and a specialist in Syriac studies. "Many of these texts come from that earlier period. They're not just academic. These texts have something to say to us." The newly digitized collection includes unpublished works by early Eastern Christian writers such as Jacob of Serugh, Ephrem the poet and Isaac the Syrian. The Chronicle of Edessa, for example, describes life in the city of Edessa beginning in the second century. One oversized 1,000-page manuscript contained 230 separate homilies by different authors. Most of the manuscripts are from a collection that the Vatican purchased in the 18th century from an Egyptian monastery. For centuries, Syriac Christians themselves were denied access to the manuscripts, even though the texts relate to their early history. 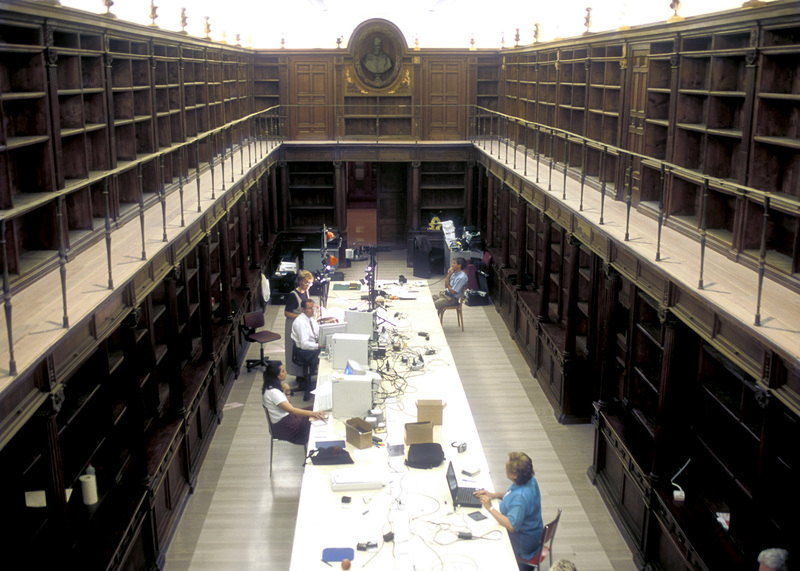 "In the last century, the Vatican Library has moved toward open access. Before that point, the library was only accessible to ecclesiastics working in the Catholic Church," says Heal. "The Vatican now is very willing to re-offer those manuscripts back to Syriac Christianity," through the imaging project, says Bishop Soro. "It is a project that has fulfilled a great need in the Syriac-speaking communities all over the world. The manuscripts that were scanned . . . contained the essence of our liturgies, worship manuals and our theologies." Heal says Syriac Christian culture grew outside of the influence of western Christianity, so it maintained its own traditions and language. The language of the church is Syriac, a dialect of Aramaic, the language that Christ spoke. "These are Christians writing in a Semitic language. Jesus himself spoke Aramaic, and taught in Aramaic. He would have preached all of his sermons and would have taught the Lord's prayer in Aramaic. And so Syriac Christians will often say that their liturgy, that their Lord's prayer, is the same as Jesus would have taught it," says Heal. For the BYU institute, the project presented a rare opportunity to work on important Christian manuscripts in one of the world's great libraries. "The Vatican Library is often known as the library of the Pope; it is his own texts. It has a collection of 150,000 manuscripts; it's the largest manuscript collection in the world," Heal says. "The library sees itself now as a repository of human history and memory." The Vatican Library project is part of a larger effort by the BYU Institute for the Study and Preservation of Ancient Religious Texts to digitize and make accessible important and endangered manuscripts from libraries and monasteries around the world. 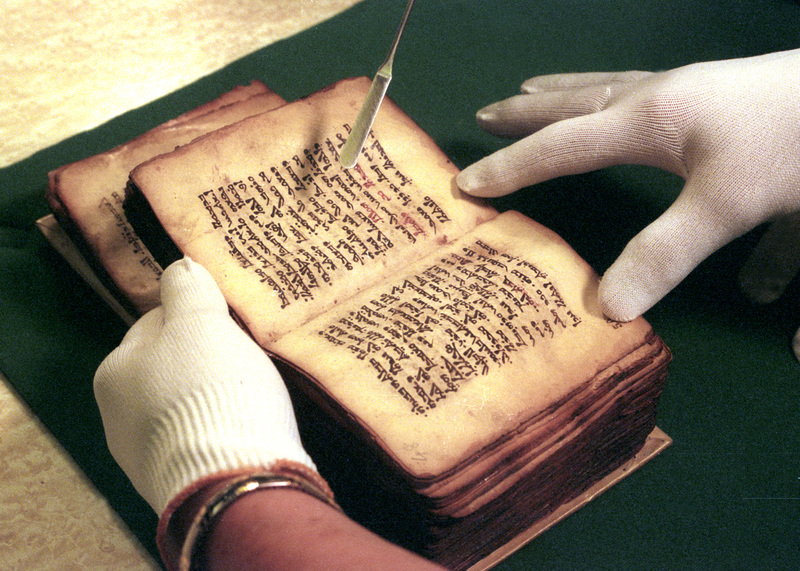 "We're interested in preserving the past, in preserving ancient texts. The Vatican Library exists for that very reason . . . and so there was a nice coincidence of interests and desires," says Heal. "The work of the institute has been bringing together technology and scholarship, putting technology in service of scholarship, and then making materials accessible." The new images, which are being positively received by scholars, are expected to generate interest in studies of Eastern Christianity. "My first reaction when I saw some of the images was that the quality is much better than the original manuscript," says noted Syriac Christian scholar and Duke University professor Lucas Van Rompay. "What I see here at Brigham Young University is really a large scale effort to preserve these manuscript collections. I haven't seen anything of the same level, of the same expertise and of the same breadth," he says. For Syriac Christian churches, who trace their origins back to first-century Mesopotamia (modern-day Baghdad), the imaging project will help preserve a culture that has historically endured political upheaval and persecution. ""These manuscripts have endured tremendous hardship," says Bishop Soro. ""More than 80 percent of our written tradition is lost, destroyed or burned by the various superpowers that successively invaded the Middle East region. The people in these churches are now busy surviving; they are not able to preserve their heritage." "The Syriac-speaking Christians are fleeing the Middle East in record numbers and don't have any other way of taking their ancient manuscript traditions with them," says Reynolds. Bishop Soro says he hopes that his church members will use the new DVD to further explore their history. "The actual benefit is that our people will see this patrimony, this heritage, put in the best medium, so that their kids, their teenagers, can look at their tradition with pride and joy and be able to learn themselves and share with the world," says Soro. "Surely this is another cause for being joyous and feeling that we have done something good." 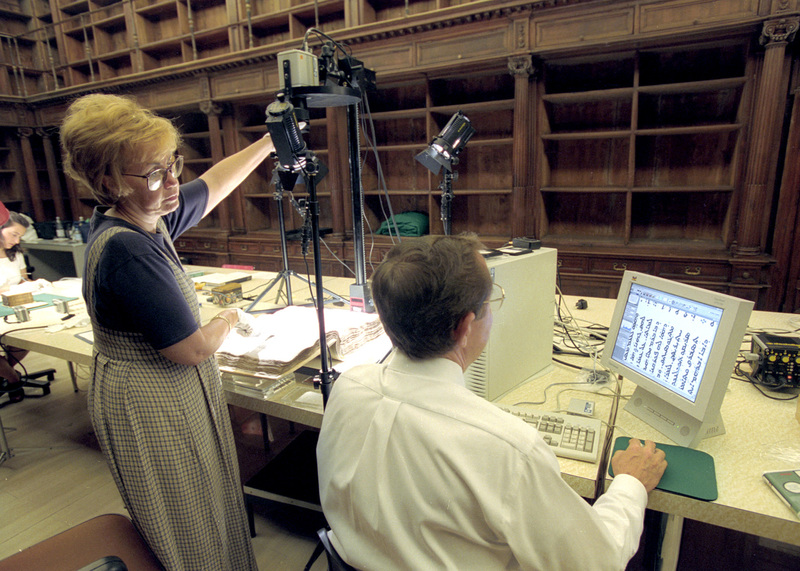 Photo Above: Working alongside their Vatican colleagues in the Vatican Library for three years, BYU scholars imaged more than 14,000 pages of text to produce a digital library of 33 important Syriac Christian manuscripts. Phtos by Mark Philbrick. (ZNDA: Baghdad) An American missionary proudly watches as a sea of Iraqi arms rise in witness to Jesus Christ and choruses of "Amen" compete with distant rattles of gunfire. The faithful sing familiar Christian hymns in Arabic, their voices bouncing off the shipping containers that protect the church from car bombs. Every Sunday, more than 400 Iraqis travel to this well-to-do neighborhood far from the protection of an American base to worship in the National Biblical Christian Federation Church. Converted from Islam and from other branches of Christianity, they are the first ripple of a tidal wave that evangelical leaders pray will inundate the Middle East. "I learned about Jesus and eternal life from a friend, and came to this church to see," said Rana Atass, who has attended weekly services at another church for the last month. Her mother, bearing facial tattoos as some Iraqi women do, stood in a line of congregants to ask church leaders for help in buying food. "The music is very enthusiastic here," Atass said. "They promise Jesus will solve many problems." At least nine evangelical churches have opened in Baghdad in the last eight months, many supported by American organizations contributing up to $100,000 per church. More than 900,000 Bibles in Arabic — along with hundreds of tons of food and medical supplies — have been sent to Iraq. About 30 Christian evangelical missionaries are working in Baghdad, and 150 others have visited since last summer. Some Christian groups focus on offering aid and avoid proselytizing. These missionaries' humanitarian and religious labors are fraught with peril. Four Americans affiliated with the Southern Baptist Convention were killed and one was critically injured after gunmen opened fire on their vehicle in Mosul. A spokesman for the International Mission Board said the Americans had been scouting locations for humanitarian and evangelical work. An influential Shiite Muslim leader, Sheik Fatih Kashif Ghitaa, said, "Iraqis already see the American occupation as a religious war." Ghitaa said Shiite and Sunni clerics have discussed issuing a fatwa, or religious edict, against missionaries. The missionaries — a mix of professional proselytizers and novices with little or no preparation — are buoyed by President Bush's evangelical bent, his oft-repeated biblical references and his vision of freedom spreading out from a saved Iraq. "God and the president have given us an opportunity to bring Jesus Christ to the Middle East," said Tom Craig, an independent American missionary working in Iraq and Cyprus. "This is my commandment. No amount of danger will stop me." The Colorado Springs-based Christian and Missionary Alliance helped turn the National Biblical Christian Federation Church into a beachhead of Western Christian prayer eight months ago, intensifying a clash of civilizations that has consumed the Middle East for centuries. As the U.S. prepares to return sovereignty to Iraqis on June 30, amid violence and anti-American demonstrations, the stakes have never been higher. "Iraq will become the center for spreading the gospel of Jesus Christ to Iran, Libya, throughout the Middle East," said Kyle Fisk, executive administrator of the National Association of Evangelicals, which represents 4.5 million Christians in the United States. "President Bush said democracy will spread from Iraq to nearby countries," Fisk said. "A free Iraq also allows us to spread Jesus Christ's teachings even in nations where the laws keep us out." Iraqi political leaders worry that evangelical efforts will undermine the nation's stability. "Extremists, whether Muslims or evangelicals, inspire violence and hatred," said Mahmoud Othman, a member of the Iraqi Governing Council. "The newspapers are screaming about a Christian conspiracy." Missionaries say their work is bringing freedom to Iraq. "We don't force Jesus Christ's love on anyone," said Darrell Phenicie, an American missionary who teaches theology in Baghdad. "Doesn't freedom of religion mean the right to learn about other choices?" Evangelical churches were illegal under Saddam Hussein, although Iraq's 300,000 nonevangelical Christians were permitted to practice. Proselytizing is banned in most Middle East nations, but Fisk and other evangelical leaders hope to train Iraqi missionaries to work discreetly in other Arab countries. Humanitarian aid is the point of entry for many Christian groups. National Biblical Christian Federation Church has distributed more than 60,000 aid boxes prepared by Samaritan's Purse, an organization headed by U.S. evangelist Franklin Graham. Many of them were given to Muslims, said Ghassan Thomas, an Iraqi pastor. "Handing out food is a perfect time to talk about Jesus Christ with nonbelievers." Two blocks away from Thomas' church, evangelicals are building another house of worship, an oasis of marble and bright lights on a dusty, rundown street. The new church has received about $50,000 from Missouri-based Assemblies of God, said Pastor Jules Vivan, and another $50,000 in supplies and assistance from independent American missionaries. Vivan preaches to only 150 parishioners, but he said his goal, set with assistance from Assemblies of God, is to attract 10,000 more in the next five years. "It is every Christian's requirement to share Jesus Christ's gospel with everyone on the planet, including every Muslim," said Richard D. Land, president of the public policy arm of the largest U.S. Protestant denomination, the Southern Baptist Convention. "If that causes anger and violence, it only shows we must speak more loudly." Some Iraqis and nonevangelical religious leaders say the White House and U.S. military should protect missionaries as well as regulate how they seek Iraqi converts. Curtailing the work of evangelical missionaries, however, may be politically vexing. Bush's chief political advisors have said that religious conservatives will be a linchpin in the president's reelection strategy. "Iraq, and the war against terrorism, will be very important in getting evangelicals to the polls in November," said Ralph Reed, former director of the Christian Coalition and now chairman of the Bush reelection campaign in the Southeast. "And it is anything but surprising that evangelical pastors would view their own religion as superior to other faiths. Teaching others about Jesus is part of Christianity." "Each individual and group that lives and works in Iraq must make their own decisions," said a White House official, who spoke on condition of anonymity. "These are private groups. Their safety is their responsibility." Phone calls seeking comment from the U.S.-backed Coalition Provisional Authority in Baghdad were not returned. Reed and other evangelical leaders said most missionaries working in Iraq show a deep respect for Islam and cultural sensitivity. They agreed, however, that the discretion was not shared by all organizations. Leaders of smaller church groups argued that sensitivity was secondary to saving Iraqi souls. "Yes, sharing Christ's love causes conflict. But the alternative is allowing people to go to hell," said Todd Nettleton with Oklahoma-based Voice of the Martyrs. American VOM missionaries have passed out Christian tracts in Baghdad traffic jams, among other activities. Such attitudes are frequently heard in the evangelical community. "Many evangelicals feel war in Iraq is part of a broader religious mission," said John Green, a professor at the University of Akron in Ohio and an expert on the religious right. "And the Bush campaign will do anything they can to mobilize that bloc. Evangelicals not only vote Republican, they produce lots of activists that stuff envelopes, make phone calls — they are the grass roots." Evangelical leaders said they were rushing to establish churches in anticipation that Iraqi laws would curtail missionary access after the return of sovereignty. "Christians believe we have a six-month window in Iraq," Nettleton said. "Our attitude is: Let's do everything we can now." American evangelical organizations, including Voice of the Martyrs, the Southern Baptist Convention and Pennsylvania-based Assn. of Baptists for World Evangelism, have said they will focus much of their proselytizing on Muslims in Iraq and surrounding nations. That focus, however, concerns other Westerners working in the Middle East. "This adds to a growing perception that all Americans want to convert Muslims," said Leanne Clausen with Christian Peacemaker Teams, an American aid group that does not proselytize. Nonevangelical Iraqi churches have been vandalized in recent weeks. Newspaper editorials and Islamic clerics charge that Americans are in Iraq on a religious crusade. Clausen warned: "The missionaries coming here don't realize the danger they are placing us in." Some of those dangers extend to missionaries visiting Iraq who are unprepared for violence. Independent missionaries working in Iraq have little or no formal training for war zones. Some are just American pastors who fly to Iraq and begin working on behalf of a new church. Iraq's new churches report enormous success in attracting parishioners. Almost every night they are filled with the newly faithful, drawn by the dynamism and energy that have fueled evangelical growth in the United States. "When I come here, my heart sings with happiness," said Jonvia Elias, an Iraqi homemaker who attends the National Anglican Church of the Christian Union. "We learn how to love Jesus and feel joy. It feels very young here." Others, particularly converted Muslims, fear that their attendance is dangerous. At the Holy Renaissance Evangelic Church in Baghdad, a Friday service included three Muslim women in head scarves. All were regular attendees and said they first visited the church at the urging of close friends or missionaries. They continued to attend because of the church's message of love and upbeat music and community. All, however, feared for their safety. "I was invited to this church, and I found peace and love here," said 30-year-old Khalida Khamid. "But I do not tell anyone I am here, and if there are any photos taken, I will leave. It is dangerous." Other converted Muslims said the promises of evangelical Christianity outweighed the risks. Atass' father, a Muslim who she said was not very devout, forbade her to attend her church. But after a church member helped her find a new job, he relented. "Baghdad has changed since the Americans came," Atass said. "It is harder now. I ask Jesus to help." As Atass spoke, her mother finally caught the attention of church leaders. They listened to her problems and handed her a box that contained some food, cleaning supplies and a pamphlet about Jesus' life. "I want eternal life," Atass said, "but we also need enough to eat." This past Christmas, Rita Elias and her family didn't celebrate outside their home. In fact, as a Christian in predominantly Muslim Iraq, Elias almost never openly practices her faith these days. "We rarely go to the church now," she says. "There is a fear of bombs in places such as churches." The aftermath of war has forced many changes in Elias's life. Her family locks its Baghdad home - recently repaired after a bomb fragment destroyed their rooftop storeroom - at dusk. "The robbers and thieves rule the night," says Elias, 30, who works for the Middle Eastern bank. "It makes me feel like a prisoner in our own house." The stock exchange where she worked as a trader is now inhabited by squatters. Now she works at a branch of the bank and a minibus picks her up each morning to take her there. Always fashion-conscious, Elias has never donned the headcovering many Muslim women wear. But now, with growing sectarianism, she says she stands out. "People are staring at me. Before, they didn't," she says. "I don't think I have to wear a scarf as a Christian." Right after the war, Elias says, American soldiers would patrol the streets and "talk to people, buy things from shops and play soccer with the children." She rarely sees them on patrol now because of increased attacks. Elias, who has sisters in Michigan, looks at the soldiers as a symbol of the promised land. "If I got the opportunity I would leave," she says. "I would prefer America." Nearly 400 women of the Assyrian Church of the East in San Jose attended a tea party fund-raiser earlier this month for their church. It was designed to raise money for a new church that will be built in south Almaden near the Quicksilver Park on land that recently was purchased. The current church, St. Joseph's Cathedral in Willow Glen, continues to expand and the 400 families that attend need larger facilities. The women attending the tea varied in age from very young ladies - at the youth group table - to grandmothers. More than 40 women from the church spent $50 each to sponsor a table and decorated it with themes ranging from traditional Assyrian to Japanese to crystal. Tables were named for cities in Babylonia and featured themes such as "Assyrian Star", "Gates of Ishtar", "Hanging Gardens of Babylon" to "Ladies in Wonderland", "Valentine" and English Garden". Centerpieces included lovely bouquets of flowers, candles and Assyrian sculptures such as the Winged Bull and a miniature version of the walled Assyrian Kingdom. The women invited friends and/or family and served a meal on exquisite heirloom china or with china matching the table's name. Sherry Rad, a church member who bought two tables and owns E Events, provided service plates. They dined on tea sandwiches, pastries and cakes. The three-hour tea featured the Assyrian Church of the East's Bishop of the Diocese of Western California, Mar Bawai Soro. He discussed the transformation of women's roles in the 21st century Assyrian society including how society can help women to excel in all aspects of life and the cost of supporting women in social involvement and education. The bishop also discussed women's roles as teachers, healers and leaders, in addition to their role in the church and the community and their influence on the church's society. The tea also featured a raffle with donated gifts, including an airline ticket to travel anywhere within the United States, a gift certificate for Guadinos in Los Gatos, jewelry including two necklaces, a gold Assyrian star and a gold cross pendant, statue and paintings, candles and other art work. The church holds four fundraisers at its current location, 680 Minnesota Ave. in Willow Glen. Although this is the first time the tea party has been held, the ladies plan to make it an annual vent. Each year the church holds an Assyrian festival in August; a two-day event with Assyrian dancing, food and culture plus exhibitions. They also hold Christmas and Easter bazaars featuring food and decorations in addition to traditional games. The bazaars are held in the recreation hall next to the cathedral, which is also is rented out for weddings and parties. The comment made by Alfred Alkhas of California in the last edition of Zindamagazine was stirring and yet thought-conducive. The comment concerning Mr. Ken Joseph may be shared by many Assyrians around the world, however, the fact remains that at least he is in the middle of the battlefield trying to help his fellow-Assyrians any way in which he is able to. The point I want to make is where is the patriarch, His Holiness Mar Dinkha to be found when his people – both those who are members of the Church of the East and non – need him most? Yes, Ken Joseph is a Protestant, but where are the so-called true ‘shepherds’ of the Assyrian Church of the East hiding themselves in the most critical juncture of the history of their people? It has been over a year now and Patriarch Mar Dinkha has not made his voice heard with regard to the issue of Iraq. When the time had come last spring for the liberation of the Iraqi people from the tyranny of Saddam Hussein, all of the world’s Christian leaders, especially the pope and the various patriarchs of the Middle East, had risen up to voice being against the death of innocent people; it is understandable that as Christians, and especially as religious leaders, they were not expected to condone a military attack. But where was Mar Dinkha in all of this? Did he voice the opinion and stand of his Church with regard to the whole issue of a military attack? He was nowhere to be found to offer paternal guidance and spiritual care – not a word; not even a prayer!!! 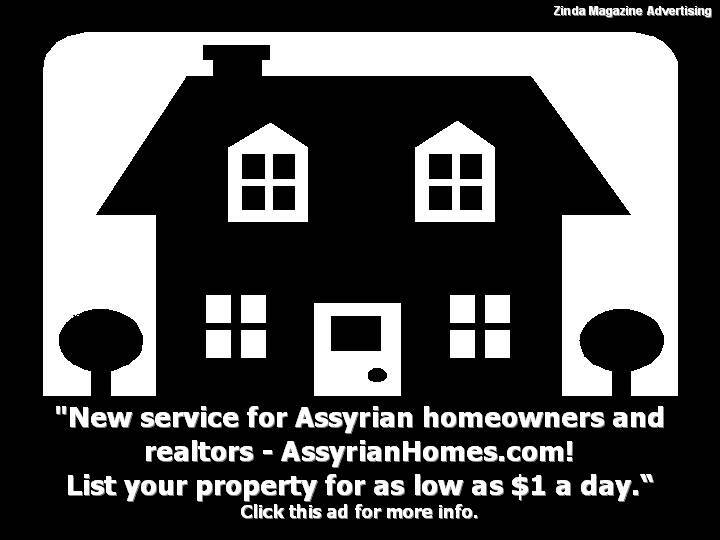 And now that the issue has turned to the name of our Assyrian nation – whether to make use of a compound name or not – he is still hiding behind the comfort of his own privatized life in a small, secluded suburb of Chicago. To him, it seems, neither the Assyrian people nor the Assyrian Church count; out of sight, out of mind. As a faithful son of the Church of the East I call upon His Holiness Mar Dinkha to stop hiding and take up his responsibilities as a spiritual father. The first step is to return to Iraq and re-establish his headquarters there as it once was; I understand that this will require the patriarch to renounce much of his comfort and luxury! Then, he should unite with Mar Addai and seriously work on reuniting our two churches as we once were before the split. Only when our two patriarchs unite and operate together as brothers in Christ can they really propose to be models for us and preach the gospel to the Assyrians. I further call upon the bishops of the Church of the East to pressure the patriarch into returning and taking up his duties, thus breaking the silence which they too have operated under and participated in, possibly for their own personal gain and comfort as well! It is my hope that this message will somehow reach Mar Dinkha and all of our Assyrian bishops, and that he and they thoughtfully ponder these ideas, for they can only be for the betterment of our church and people. If not, I am sorry to say that he will no more be able to effectively be a spiritual leader for the church and he will forfeit any right to be a moral guide for his people! I was very surprised to see that in Zinda's weekly poll a large majority of people voted that they approved of Yonadam Kanna's handling of the political matters pertaining to the Assyrians in Iraq. Article 53. (A) The Kurdistan Regional Government is recognized as the official government of the territories that were administered by the that government on 19 March 2003 in the governorates of Dohuk, Arbil, Sulaimaniya, Kirkuk, Diyala and Nineveh The term "Kurdistan Regional Government" shall refer to the Kurdistan National Assembly, the Kurdistan Council of Ministers, and the regional judicial authority in the Kurdistan region. Maybe the people that approve of Kanna's handling of the situation will think again after reading the above! We will have a Kha b'Nissan celebration here in Vienna on Friday, 2 April 2004. The price of the ticket is 5€. and the music is provided by DJ Elsin. The Assyrian Universal Alliance and the Assyrian Democratic Movement in Detroit are hosting the Kha b'Nissan on April 3rd at the Macedonian Cultural Center located on the corner of 19 mile and Ryan Road in Sterling Heights. Our singer is Emmanuel Bet Younan. Tickets are 40 dollars with dinner. Mor Jacob of Eddessa attempts to resolve the problem of angelic sin raised by Origen and the Cappadocian fathers. He develops an idea found in the Poemata Arcana of Gregory of Nazianzus, which puts the angels within a triadic hierarchy of divine, angelic and human nature. Jacob thereby demonstrates how their intermediate position reveals their ambiguous nature, as they are a point of contact between both the spiritual and physical worlds and share qualities of both. This hierarchy is symbolized in Jacob's cosmology by the relative positions of the sun, stars and the moon and the combinations of physical elements of which they are composed. Finally, the theme of triadic hierarchy is extended to the angels themselves, for which Jacob is dependent on the Celestial Hierarchy of Pseudo-Dionysius the Areopagite. Archaeologist Mr. Abd al-Salam Sim'aan al-Khdidi has completed finally a study about the historical background of the village of Baghdeda. Abd al-Salam is a graduate of the College of Literature, Archaeology Dept. in Mosul University 1973. Abd al-Salam has been working for the Iraqi archaeological dept. since 1975. In different capacities, he worked with many international groups throughout many sites in Iraq. He worked with Prof. McGuire Jason (University of Chicago) and then Prof. Robert Adams; Prof. Baez (German excavation team); Dr. John Nicholas (British School); Dr. Helka (Austrian team); Dr. Charles Bernie (Manchester University); with other teams from British, German, Polish, and Italian backgrounds; and lastly but not least with the expedition of the British Museum under Prof. John Curtis. Abd al-Salam worked with many Iraqi groups as well, again, in one capacity or another, in many locations at Hatra, Ashur, Ur, Aski Mosul, kharbat Zakaria in Baghdeda, and others. Archaeologist al-Khdidi states that there are at least fifteen archaeological sites in Baghdeda, most importantly are Tell Yatha and kharbat Zakaria. These two sites are very important because they indicate that settlements in Baghdeda date back to the sixth millennia B.C., starting with the Hassuna, Ubaid, and the three Old, Middle, and Neo-Assyrian periods. Furthermore, and during preparations for the eastern al-Jazeera irrigation project, al-Khdidi was part of much work in 1986-1987. The project required archaeological excavations in various Baghdeda locations such as Jammikyatha, Tell Mansour, Naqirtaya, Bashmoni, Sarkis, Bakos, khara'b Franso, Qasha, Jaddad, Habash, Dinha, and other well-known archaeological locations around Baghdeda such as Tall Ghanam, Barbara, al-Sawwan, Bashbeta, Blawat, Sheik Amir, al-Msulli and others. All the above excavations have strongly proved a continuous settlement in Baghdeda for almost eight millennia. In his study, Archaeologist al-Khdidi relied on many references, including archaeological, historical, geographical, cultural, architectural, and linguistic. All these aspects, he states, prove beyond doubt the rooted history of Baghdeda and its people. The people of Baghdeda are indigenous to the region and belong mainly to the Assyrian background, and then Aramean and to a lesser degree other groups. Moreover, since people do not disappear with the death of their governments and states rather remain alive and continue to make history and civilization; we are going to prove that the people of Baghdeda live an eight millennia continuous civilization. We look forward to the study of Archaeologist Mr. Abd al-Salam Sim'aan al-Khdidi, another link of our people in the villages of Nineveh plain to the Assyrian civilization. Charles Mills in "The Sociological Imagination," writes that when people cherish some set of values and do not feel any threat to them, they experience well-being. When they cherish values but do feel them to be threatened, they experience a crisis—either as a personal trouble or as a public issue. And if all their values seem involved, they feel the total threat of panic. But suppose people are neither aware of any cherished values nor experience any threat? That is the experience of indifference, which, if it seems to involve all their values, becomes apathy. Suppose, finally, they are unaware of any cherished values, but still are very much aware of a threat? That is the experience of uneasiness, of anxiety, which, if it is total enough, becomes a deadly unspecified malaise (Mills 2000). The name issue seems to have taken the Assyrians to this grand square of many avenues. Let us consider the threat of immigration, which continues at an alarming rate. Most of the second generation Assyrians in the Diaspora do not read, write, or barely speak their mother tongue. The set of values held dearly by the parents of these second generation Assyrians are surely being lost, and while this is a crisis to many, nationalists go further and panic. Nationalists have continued to panic because of immigration, lost of language, and assimilation, yet, they have done almost nothing to resolve these grand national issues besides biting their nails. Today, certain of these claimed nationalists return to express more panic feelings because of the name issue and the political compromise of using the term Chaldo-Assyrians proposed and used by the ADM (ZOWAA) in Iraq. Mills explains in his book (first published in 1959) that in less than two generations, the world witnessed tremendous earthquakes of change. He adds that colonies were freed, totalitarian societies rose only to fall, democratic systems proved to be restricted to the selected few, and revolutions became the path of men seeking a new sets of authoritative symbols (Mills 2000). Thus, men, no longer capable of orienting themselves with these rapid changes of time, feel complete disassociation with their cherished values. Most of these men lack the quality of mind to help them develop reason in order to feel the continuously anew environment around them. A golden cage cannot buy a bird its freedom and dreams and expression of emotional outcry alone can neither erase the sense of crisis or panic. Man must develop sociological imagination in order to understand the larger historical scene and its relation to every individual in any given society. History and biography are intertwined in society. In today's world, we no longer are capable to live alienation; unless Assyrians are powerful enough to declare Assyria and be able to defend it, we must learn to live to be part of societies shared by our neighbors. Only when we succeed to understand the bigger picture thoroughly, we truly grasp the two aspects of personal problems and national issues and the strong relationship between the two. In today's environment, Assyrians' focus and motivation must be integrated with the means to alleviate this mode of living in a crisis and to break through the ring of continuous panic suffocating certain Assyrian nationalists. The Assyrians have limited resources and when their political organizations and civic institutions engage in battles separately, chances of winning these battles become slim. The concept of united front, if initiated thoroughly and faithfully is the only mean through which a grand progress could be achieved. When an Assyrian group (A) confronts another Assyrian group (B) and when a third Assyrian group (C) struggles on its own to confront a common foreign and known hostile group (D), the outcome ultimately is the loss for the Assyrian groups A, B, and C and a victory for D. Assyrians cannot afford this. If Assyrian political groups and civic institutions continue to view the Assyrian national aspiration as a personal enterprise, they are doomed to fail and most crucially continue to lead the Assyrian cause, whenever a chance looms, to repeated catastrophes. Imagine this scenario millennia ago. A newly appointed general that is camping on the gates of a strong besieged city, insists not to feed his hungry and tired troops the basic bread or potatoes luncheon on the grounds that he is going to provide them with honey and sweets the next morning when he overtakes the city. This army leader is taking greater risks of having his troops slaughtered if a counter attack somehow took place and the troops were not restful and strong. In a condition as the one Assyrians are in today, if Assyrian leaders failed to look at the grand picture of Iraq and failed to provide adequate summations, cohesive assessments, and comprehensive orientations, they in reality are living a dream, committing the grand fraud, and endangering the presence of Assyrians in Iraq. Assyrians must find the common ground between what Mills categorizes as those who observe without thinking and those who think without observing. Most importantly, they must analyze the degree and depth of this observance and thinking. We all know that with dreams alone Assyrians cannot gain Assyria; however, by stating this no one is asking our leaders not to dream. We must learn how to dream while keeping our feet on the ground. As Mills teaches us, a visionary cannot be rigidly confined to high level of abstraction that the typologies' they make up seem more often an arid game of concepts than an effort to define in a clear and orderly way the problems at hand, and to guide our efforts to solve them (Mills 2000). Therefore, while few claimed Assyrian nationalist dreamers demand Assyria and marginalize the efforts of others who have their feet on the ground and live the reality, the simple question of a logical and non-emotional should be: If we disagree with the path of the ADM (ZOWAA) in Iraq, how are we going to establish Assyria or what are the alternatives? It is one thing to welcome an abstract painting of Assyria and cherish it; it is damned another to cause chaos and follow a self-appointed commentator who does not have a clue about problem solving of national proportions. It is one thing to go to a circus and have wholesome fun; it is damned another to listen seriously to a disc-jockey who have no idea how to answer that simple question of "how" yet follow him to the undisclosed steep cliff of uncertainty. (ZNDA: Orlando) The United States has been called “the Great Melting Pot,” referring to the vast wealth of different cultures and people that have been called to America by its promises of freedom and liberty. For one Recruiting Station Orlando Marine, his family answered the call and escaped from a hostile country to settle in the land of the free. Staff Sgt. Edmond Ahkteebo, a recruiter at Recruiting Substation Bradenton in Florida., was originally born in Baghdad, Iraq. With his fair skin, light green eyes and Mid-western accent, a person would guess he was from any number of places. At the young age of four, his father was able to bring his family to the United States and settled in Chicago. “My father told (the government) we were going on vacation to Beirut, Lebanon and we just never came back. My Dad had friends at the U.S. Embassy and they gave us green cards right away allowing us to move to the United States,” said Ahkteebo. Ahkteebo’s family is Assyrian, one of the four major nationalities in Iraq. He explained other Iraqis have heavily persecuted Assyrians because Assyrians are the only Christians in the entire country. “We’re like second-class citizens. If you’re not Muslim you’re second-class. But all that has changed since Saddam Hussein has been taken out of power,” Ahkteebo explained. 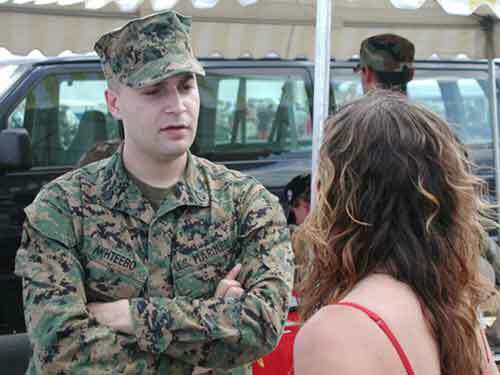 Even though he comes from a more unique background than many Marines, he believes he is no different than any other Marine. Many times, curious Marines will ask about his name or his origin and he is more than willing to talk about it. “(Marines) find it hard to believe. They ask me why did I leave my country, if I am Muslim. It’s an interesting subject to them,” he explained. After living in the U.S. for over 20 years, Ahkteebo still has ties to Iraq. His mother still keeps in touch with two brothers, both of whom fought for Iraq in the first Gulf War, and his father keeps in touch with his sisters. Having family living in Iraq and knowing the conditions they were living in before the war started made it tough for him to have to sit out the war. “I don't believe that things are better, I know they are, from family members telling us. Things aren't the greatest right now, but it's going to get better and they know it," he said. “My parents have told me all of the horror stories. You had to have a picture of Saddam Hussein in your house, just all of the basic rights we take for granted (were denied in Iraq),” he said. “Everyday (during the war) I’d watch the news and it would be eating me up inside because it’s my country. I speak the language and I should be there with the Marines and helping out with the reconstruction of the country,” Ahkteebo said. Ahkteebo’s enlistment into the Marine Corps could be considered as unique as his background. He explained that when he decided to join the Marine Corps he only had a general education degree and scored a 48 on the Armed Services Vocational Aptitude Test. To join with a GED, he had to have a score of 50 or higher. His desire to join the Marines and serve his country was so strong, however, that he was not going to take no for an answer. After dealing with his recruiting station commanding officer and the Eastern and Western Recruiting Regions, his quest finally led him to the Commandant of the Marine Corps. After several attempts at calling the Commandant, at that time it was General Charles Krulak, he was finally able to get through. “He said ‘You keep calling here and harassing my secretary’, so he took my information and the (recruiting station commanding officer) called me 15 minutes later. Two days later I was at (the military entrance processing station),” explained Ahkteebo. “I thought it was important to serve my country and the best way to do that was through the Marine Corps,” said Ahkteebo.